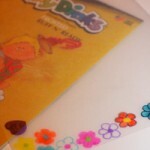 I’ve always loved Shrinky Dinks and the mysterious way they shrink and thicken up when you bake them in the oven. 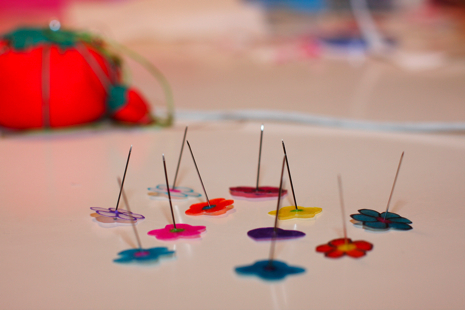 So when I decided to do a pincushion project for this week’s “Take Five & Company” craft segment, I couldn’t resist the opportunity to incorporate Shrinky Dinks. So I bought a 10-sheet pack in frosted white, got out my Sharpie markers and started drawing simple flowers that measured about 3/4″ on the sanded side of the plastic. 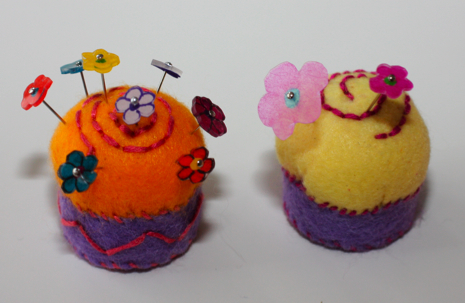 You can see a before and after baking flower comparison stuck into the yellow pincushion my friend Debbie made pictured at the top of this post. 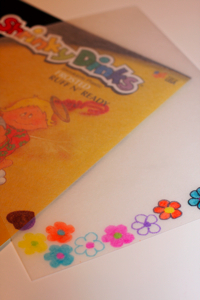 It’s been a while since I’ve played with Shrinky Dinks, and I’m happy to report that they still rock! crafting on TVembellished pinsshrinky dinksWZZM "Take Five & Company"
This is really fascinating, You’re an excessively skilled blogger. I’ve joined your feed and look ahead to looking for extra of your magnificent post. Also, I have shared your web site in my social networks! We stumbled here by a different web address and thought I should check things out. I like what I see so now i am following you. Look forward to exploring your web page repeatedly.